Antipodes will forever be one of my favorite brand. Personally I really enjoy using Antipodes skincare. Antipodes is a New Zealand brand, widely available in UK. The Joyful and Rejoice both contain Avocado Oil. Avocado oil is a nutrient-packed superfood that provides a multitude of benefits. It is packed with Vitamins A, B1, B2, and D - plus the powerhouse antioxidants Vitamin E and chlorophyll, which help reduce skin damage and unwanted ageing. These antioxidants work together to collect and neutralise free radicals, highly reactive molecules and unstable compounds that can destroy skin cells and DNA. The Antipodes Joyful Hand and Body Cream just smells incredible. The cream contains Avocado Oil, Wild Blackcurrant Berry and South Pacific Hibiscus Bloom, guess this combination makes it smell so good. I tend to use Joyful as my hand cream, as it keeps my hands moisturised, what I like the most about the cream, is that it does not leave my hands feeling sticky. My hands just tend to drink up the product. If you use it on your body, your skin will be brightened and toned by the inclusion of hibiscus flower extract, which acts as an exfoliator for dead cells, freshening and plumping skin and locking in moisture. Blackcurrant berry oil, packed full of vitamins C and E, purifies skin by absorbing and neutralising free radical damage. Antipodes Rejoice Light Facial Day Cream is a light and non-oily facial day cream that enhances skin's natural hydration. All organic ingredients of manuka honey, sweet almond and avocado oil combine with macadamia and jojoba to balance and moisturise. Manuka flower oil has antibacterial, healing and protective properties that benefit the skin and the extraordinary collagen boosting powers of avocado oil soften and regenerate. My skin gets on so well with the Light Facial Day Cream. Skin seems to be drinking it up really quickly, skin is left feeling moisturised. Luckily it does not break me out, you can wear it under your foundation. For my night cream I still reach for the Antipodes Avocado Pear Nourishing Night Cream packed with powerful botanical extracts to deeply nourish the skin. 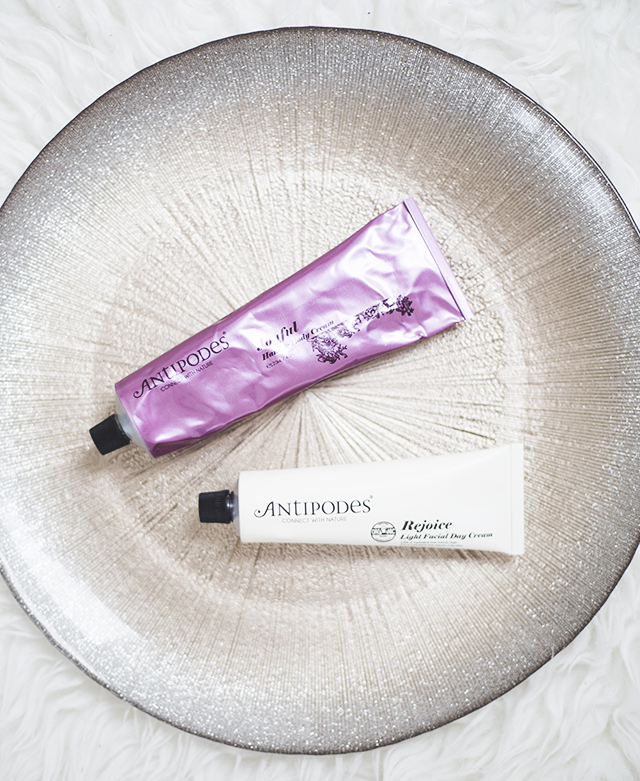 Have you tried any of the Antipodes products before? If yes, what is your favorite beauty product?